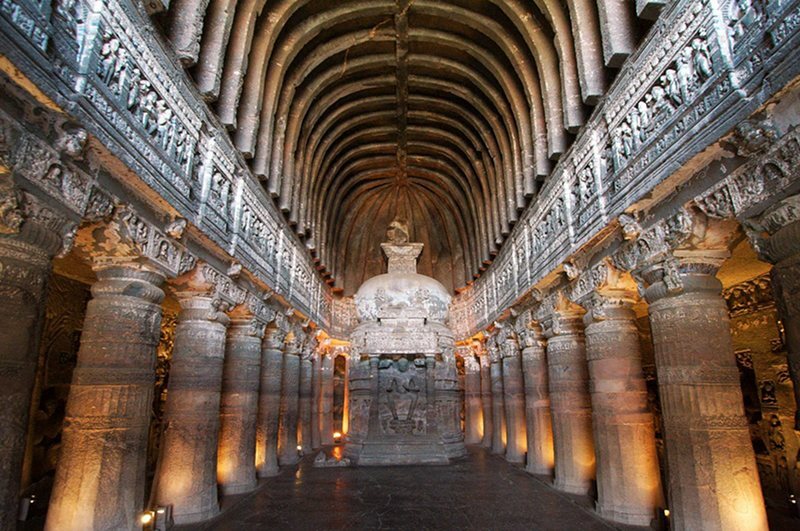 Carved over a period of several centuries, the mystery of Ajanta Caves might never have been uncovered had it not been for a chance pursuit of a tiger by the British Officer John Smith in the year 1819! As old as 200 BCE, the caves are located in Aurangabad district of Maharashtra. Over the multitude of years they fell into disuse and a forest grew over and around them. Carved over many many years by different artisans, they are believed to have been made a refuge for the Buddhist monks during the rains. Some go as far as to say that they were pathways to heaven. With numerous carvings that describe the life and times of the eras, they are like a window that one can peek through into the glorious past of India. The caves run for a mind numbing length of 29 rock cut caves, all of which have both female and male representation, which is a rare sight! Examples of immense scientific calculations are evident too, as the sun lights up cave 19 on the winter solstice and cave 26 on the Summer solstice in a precision that has persisted over the years!